I’ve been looking through the photographs I took last month on Hope’s eighth grade D.C. field trip and came across this one that I snapped as we rushed from one tour location to the next. This is the front of the former National Savings and Trust Company building in downtown Washington, D.C. It was designed by architect James H. Windrim and built in 1888. 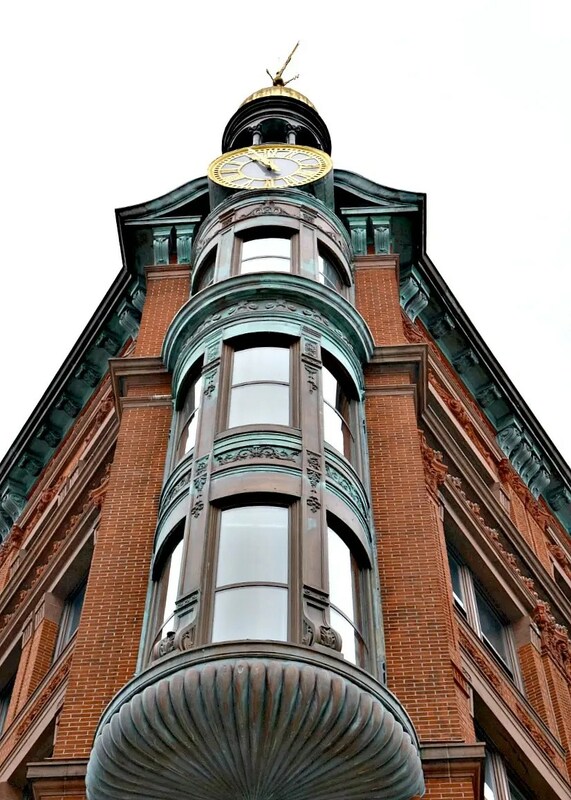 The Queen Anne Style building was constructed of red brick, terra cotta, and copper. A number of additions were made over the years. The patinaed curves and brass clock give great personality to an otherwise non-descript street corner. The building currently houses a branch of the SunTrust Bank. I LOVE the perspective of this photo. I often almost stand on my head to get shots like this! Yes, wow! It looks massive and still beautiful. Impressive shot! I'm Paula, a pastor's wife, a mom of four blessings, a collector of vintage Pyrex, and a firm believer that chocolate and cute shoes make everything better.